Do You Have 'It' ? I wonder how many of you see yourselves in this short video ... I know that I do. As a kid, I always loved to take things apart to see how they worked. Although building wasn't the driving-force to get my ticket as a teenager, I soon became an ardent homebrewer and have loved building radio gear all of my life. When in high school my favorite classes, and teachers, were the shop courses which led me to become a Tech-Ed teacher at 21 years of age. I think it all started with an early case of the ' knack'. A recent posting to Yahoo's 'GQRP' reflector spurred discussion of the growing number of fake transistors being seen on e-bay. A builder enquired about the low efficiency noted in his recently built Chinese '49er' kit. I recently bought one of the Chinese Forty-9er transceiver kits off ebay and on receive it works well. It certainly transmits, but the power is down to 800mW and the driver transistor is getting very hot. I'm not expecting a lot of power from it, but power claims are 1.8W to 3W. I'm more concerned about the hot driver transistor. The following link shows the circuit diagram. I've checked for spurious oscillation (a problem I've had before), but can find nothing. Does anyone have any ideas for why the transistor is getting hot? It was suggested that the transistor in the PA may not be up to specs and even be a 'fake' as these types are commonly noted on e-bay, selling for prices that are too good to be true. Without taking a close look at your built kit, my suspicion would be the PA transistor. The schematic provided in the listing to which you provided a link shows a D882 as the PA transistor. This is a 2SD882 transistor is a garden variety audio amplifier transistor at best. Some data sheets show a fT of 100 MHz. These 2SD882 transistors are listed and sold by the handful on eBay for a couple of dollars for a dozen (plus and minus). 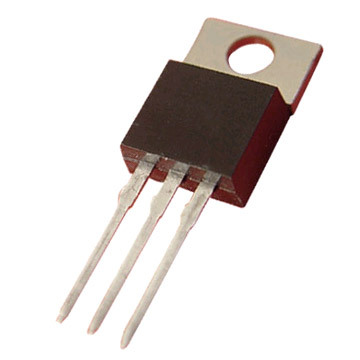 Perhaps substituting a good quality better suited to RF duty transistor would be the ticket. Perhaps something like a 2SC1971. But before you start looking for listings for a 2SC1971 be aware of the fake ones that also quite prominent on eBay and sell for only a few dollars. 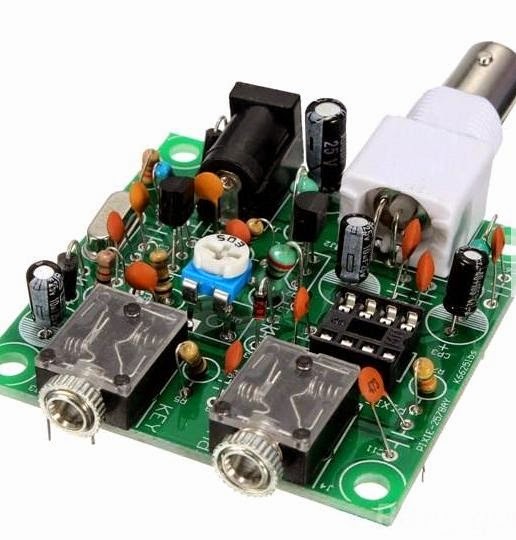 On eBay search for "eleflow" this is brand name of a manufacturer who is making good quality substitute devices for a number of the popular CB and HAM radio PA transistors - user name on eBay is weazle66. His listing for this particular device is 27187465609 BUT you will pay as much for this replacement PA transistor as you did for the kit ... To find out more about some of these fake replacement transistors, search for "FAKE 2SC1969 RF transistor" or "FAKE NEC & MITSUBISHI RF TRANSISTORS" on youtube. The poster has a number of such video postings. Searching Google for "fake transistors" or such will turn up much interesting. Firstly, thanks for all your help. Initially, I replaced the Chinese PA transistor with a BD139 and that increased power output to 1.2W and reduced the heating of the driver. Key down and it took perhaps 20s to get "finger hot", rather than 10s. Tonight I changed the driver transistor to a 2N3904 as used in the original Forty-9er and the driver heating seems to have gone away. A small heatsink on the PA transistor allows it to run at 1.4W output for 30s of keydown without any drop in power or the heatsink getting any more than warm. Thanks for all your help and I hope this helps someone else. Earl Andrews, VE3AB, has gone to considerable effort to test and compare many of his transistor purchases and indicates that there are a lot of devices coming out of China that are outright fakes and have no hope of meeting the specs that you might expect. His interesting website has a lot of details about testing as well as a very comprehensive 'for sale' list of reliable devices. Earl also suggests using caution when buying e-bay Chinese electrolytics as his measurements of ESR values indicate that many do not pass specs. If you have purchased fakes or have found a Chinese source of the real thing, please let us know ... I'm sure there are plenty of dealers selling the real thing out there. My recent interest in the remaining Canadian shortwave broadcasters (see The Lonely 49m Canadians), led me to try and QSL a couple of the stations. 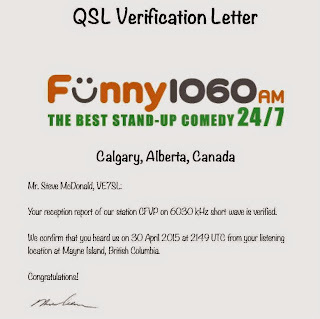 Seeing as how the CBC outlet on 6160, CKZU-Vancouver, is almost line-of-sight and just on the other side of Georgia Straight, I haven't yet worked up enough nerve to send a reception report describing their S9+40db signal! 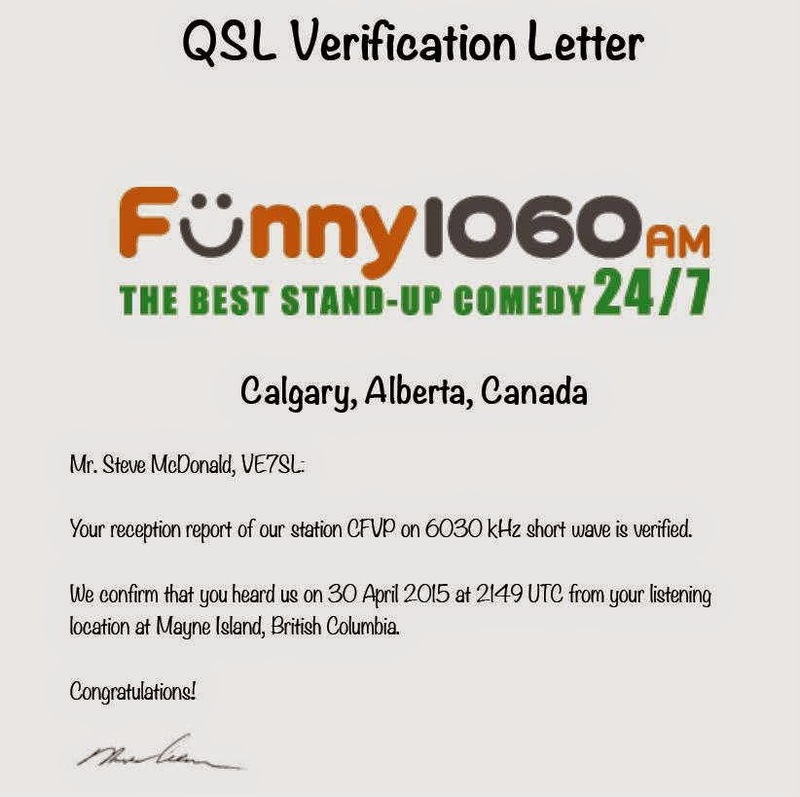 When initially listening for the station in Calgary, CFVP on 6030, I was never able to detect more than a weak, watery carrier. Conditions must have been much worse than I had suspected as normally this path is an easy one. A few weeks later, when I started looking for them again, I found their 100 watt signal to be quite robust, several days in a row. In the early afternoon, their signal was peaking 5x7 and continued to build until Radio Marti in Florida signed on a few hours before sunset and dominated the frequency for the rest of the night. An e- mail report to long-time veri-signer and Ontario DX Association mainstay, Harold Sellers, brought a quick e-mail verification. 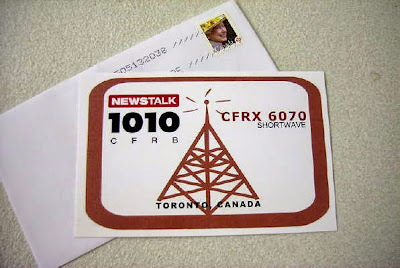 I was hoping that CFVP would still be issuing a paper QSL but nowadays that is getting to be a rarer and rarer policy. 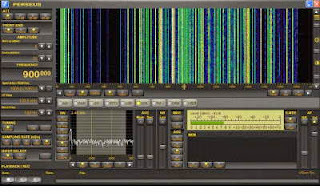 CFVP broadcasts the programming of AM 10-60, CKMX, 1060 kHz. 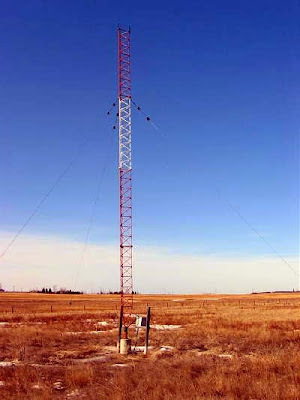 The transmitter site is located east of Calgary, just off Highway 22X Marquis of Lorne Trail, on Range Road 290. The Google Earth coordinates are 50 54’02”N 113 52’26”W. Since I started doing the QSLing there haven’t been very many CFVP reports; more for CKMX. Overseas reports have been from The Netherlands and Germany. Next on the the list was Toronto's CFRX, 6070, whose signal has been strong, starting well before local sunset. Veri-signer Steve Canney, VA3SC, requested a written report and an SASE which was quickly rewarded by a rare and very real paper QSL. 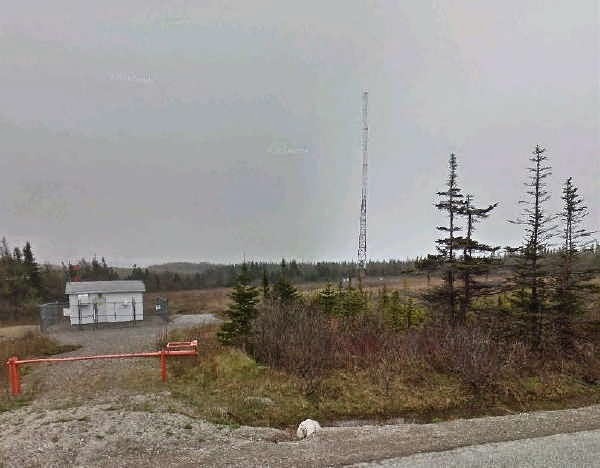 Steve reports that CFRX is simulcasting CFRB (1010kHz) using 1000 watts into an omnidirectional vertical antenna. They have received several reports from Europe over the many years that he has been sending verifications. Conditions this past weekend were surprisingly good, considering the time of year. I must admit that I was expecting three nights of summer thunderstorm QRN combined with summer-like propagation. Happily I encountered neither. The sun has been very quiet for the past couple of weeks, leading to low K and A indices and favorable DST numbers. Best catch was 'JT-390' in Stephanville, Newfoundland. Colorado DXer and YouTuber, John Bellini, has been at it again. This time it's his stealthy mast to support some small VHF utility antennas. If you're interested in a simple stealthy mast for the roof-top, you may find some worthwhile hints here. His system would make a very nice stealthy support for a PAØRDT mini-whip which would put your antenna well above the house and its associated noise fields ... have a look. It's CLE time once again! For you low-frequency buffs, another challenge awaits. This month's frequency range covers the high end, 385.0 - 399.9 kHz. A list of all of the North American targets in this range can be found in the RNA database, while targets for European DXers will be found here... specify the frequency range wanted and check 'show all results'. 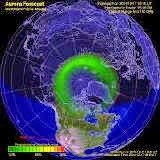 An excellent target for North Americans is little 'OO' on 390kHz. It gets out well at just 7.5watts and was heard here on Mayne Island earlier this year. an attachment) and to the List, not direct to me. # kHz - the beacon's nominal published frequency, if known. distance, offsets, etc., go LATER in the same line (or in footnotes). 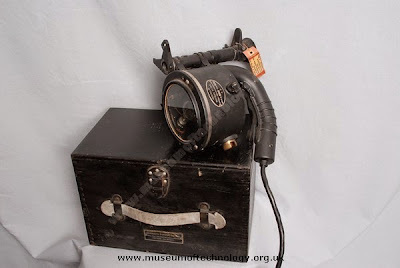 equipment that you were using. It is important to put 'CLE194' at the start of the email subject. log showing all your loggings for the event. Tuesday so that you can check that your log has been found OK.
very latest. The combined results should be completed on that day. for this Event at REU/RNA/RWW. A recent posting to the GQRP Yahoo Group brought my attention to another inexpensive offering from China. This time it's Bangood's complete "Pixie" type 40m QRP transceiver for the incredible sum of $4.16 (U.S.)! The price includes all components, a nicely silk-screened PCB and free shipping. One really wonders how it is possible to make any profit with such an offering but it obviously is. However, all may not be what it seems. One purchaser, IK1ZYW (Paolo) who built the kit, described his findings in a recent blog posting of his building experience. In spite of the problems noted above (with some now corrected), the kit still seems a bargain, if one takes the necessary care with construction. 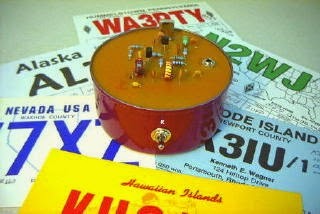 Playing with QRP can often provide ham radio's best "fun for the money" as DX- capable transmitters can often be built for just a few dollars. I vividly recall the fun I had one winter while pursuing the first-ever Tuna Tin W.A.S. endeavour on 7040kHz. I made many new friends on 7040 that winter and every weekend many of them would listen-in or call to see how my progress was going. The highlight of the adventure was late one Saturday night when I had three New England stations all answer the same CQ ... what amazing fun for a handful of parts at less than $10 ... not including the cost of a can of Tuna! The little Pixie kit offered above has a power level fully capable of W.A.S. on 40m and with the decrease in solar conditions, 40m will just keep improving. If you purchase and build one of these kits, please let us know how your experience went. The 'interesting' construction notes may be found here. A recent post to Yahoo's Perseus SDR Group posed some interesting questions. Over the past few weeks/months I have see some "power-users" on my Perseus server... and my plan was to dissect the server log to investigate the usage percentage of my server... and found that already in May the log is 240 kb and growing fast. It seems impossible to analzye by hand. Now I do notice one user, not too far away (only some 200 miles or so), seems to spend 2-3 hours per day using my server. Mostly just use all allotted time and then get back on asap. I know my antenna is nothing to write home about and the performance is mediocre if any... so this makes me wonder. What on earth do this user do with all the time?? Do others see similar behaviour?? By browsing the log it seems most, user time,70-80 per cent, are from Russia. Most others stay only for a very short period of time, up to a few minutes. Has anyone tried to hack a script that would automatize the log analysis?? Is the server abused by some? What is the optimal allowed time? and then the drop-out time? What usage load would be best to shoot for?? I notice similar patterns here. Obviously some are listening to a single frequency for the entire time, others stop by for a few seconds to see if a certain target is being propagated. And then some just tune around and see what there is to hear and see. And I'm sure some fall asleep until it times out. These are all things I have done when I am using the remote side. One thing we need to remember, an antenna that is mediocre to one person may be a window to the world for someone living in the urban noise jungle. And consider this - if there were enough remotes to choose from, scattered all over the globe, even a poor antenna would cover their locals and fill in the gap. Unfortunately, the number of remotes seem to be dwindling, esp here in N AM. Maybe summer coming and lightning season but still, even this winter, choices were fairly meagre. I'm not too concerned about the usage aspect - it's not a big drain on my internet and I see enough different names, many of whom I know personally who use it so I think most get a fair chance to see if whatever signal they're looking for makes it to my part of Alberta. Both of mine are set to 62 mins on with the minimum 2 minute reconnect time. The only "abuse" if it really is, I see sometimes is from the amateur radio side, people wanting to hear a station better in order to work a rare one or have an unfair advantage in a contest. What does annoy me is users who can't be bothered to put in their proper name or callsign or even a lat/long. And then there's a few servers that get the lat/long wrong or reversed so they wind up in a rare portion of the world and for a moment we all get excited!! Both operators raise some interesting questions! If you have used a remote SDR or do so with some regularity, how did you find the experience? What types of things did you listen or look for? How much time would you typically spend on the site? What do you think the limits on time should be? I have used a remote once or twice in the past, to listen for my Tri-Tet-Ten's chirpy, low power signal, and found it very useful but I've never used one for general listening. It's time to dust-off that precious old Vibroplex, or any other type of bug, and give it a work out! The W6FSM Bug Roundup will take place on Saturday, May 16th at 1400Z through 1400Z (Sunday). This is 0700 PDT to 1900 PDST ... a full 12 hours of old-time CW delight. 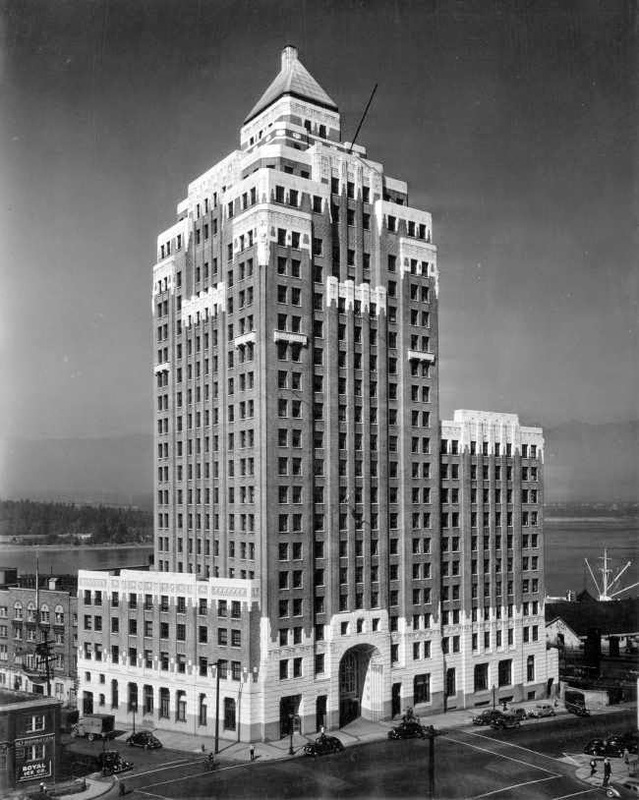 The extra sets were distributed to several of the other local troops and numerous evenings were spent, at the very top of the building, working all of the other stations. It was usually cold and windy and most of the guys just wanted to go home but I loved it and could have stayed all night....it seems that there was little hope for me, even at that age! When it came to CW I was hooked and even today, almost 100% of my operating is on CW. It's nice to see events like this and the ARRL's "Straight Key Night" along with clubs like the, "SKCC" , "FISTS", "FOC" and "The CW Operators' Club", all doing their best to keep CW alive. Hopefully you will have some time to play in the coming "BR". It appears that the FCC's plan to close two thirds of their field offices has both broadcasters and other stakeholders pretty worried. As reported by both Radio World and Inside Radio, the FCC would reduce the number of field agents from 63 to 33 and the number of directors from 21 to five, as well as cutting support staff. The number of field offices would shrink from 24 to eight. The only field (RF spectrum enforcement) offices remaining operational would be those in New York City, Maryland, Chicago, Atlanta, Miami, Dallas, Los Angeles and San Francisco. Complainants range from broadcasters and the cellular wireless industry to agencies relying heavily on communications such as police and fire agencies. Many of them are worried that interference cases will fall by the wayside with the FCC not able to keep up with mitigation issues. One seemingly odd complaint of the broadcast industry was the effects that the closures would have on the agency's ability to track down pirate broadcasters! Surely that is not a huge issue in the grand scheme of things? Responding to this odd complaint, the new FCC enforcement chief, Travis Leblanc, issued a strange policy statement saying that he would take a "new" approach when it came to pirates by doing what is needed to keep pirates from even getting on-the-air in the first place! No details of this puzzling solution were forthcoming. It would seem to me that most public broadcasters would be delighted at the thought of having less FCC oversight. At a time when more and more broadcasters appear to be "forgetting" to switch to nighttime power levels (lower) or to change antenna patterns, surely the FCC downsizing will lead to even more rogue behaviour. Amateurs relying on any help in mitigating local interference issues, power line noise and complaints from neighbours will also be swept-away in the downsizing. Unless more funding from Congress is forthcoming, it appears that the closures may really happen. Radio World reports that some of the affected industries are discussing potentially lobbying Congress to keep the field offices open but it appears the focus is on getting the agency to do things more efficiently and opponents argue that the FCC was able to run their offices under last year's budget. It will be interesting to see how it all plays out but if the closures go ahead, it won't be good for any of us ... unless of course, you're a pirate. This coming weekend offers amateurs the opportunity to work many of the Armed Forces stations via the crossband mode. 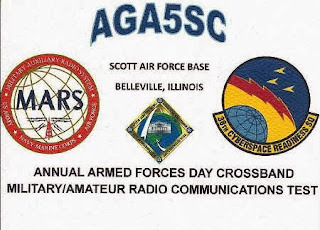 The 65th Armed Forces Day Crossband Communications Test will see stations such as NMC (Alameda, CA), NOJ (Kodiak, AK), NRV (Guam), NMN (Portsmouth, VA), WAR (Pentagon, Washington, DC), along with seventeen others, joining the 24 hour event. Activity will begin as early as May 09 at 0700Z from NRV in Guam, while others will join the fray beginning at 1200Z. Each station has a slightly different operating schedule and full details of operating times and crossband frequencies can be downloaded from here. In addition to the usual SSB / CW modes, this year will see several digital modes such as MT63, AMTOR FEC, as well as two new modes ... MIL-STD and ALE. The needed MIL-STD (Serial PSK) software can be downloaded for free from MS-DMT software. The activity gives hams and SWL's the chance to exercise their technical and operating skills. All stations will provide a special QSL for contacts made or for reports of reception. Join the fun and gather some unique wallpaper at the same time ... not many hams have a QSL from 'WAR' on the wall! As indicated in an earlier blog, a planned scan of the 49m band was made a few nights ago ... one at 0400Z (10PM local) and another at 1200Z (5AM local). Both had a decidedly different flavor. Frankly I was surprised at the number of broadcasters and especially the number from Asia, China mainly, heard in the morning scan. One information source I found indicates that most of the strong shortwave signals from China are more designed for jamming than for program content. My initial impression was that many of the more interesting low power targets from Central / South America and Africa may be a thing of the past but I may be wrong. The 'news' page, of the World Wide DX Club, seems to indicate that there are still lots of juicy targets out there if you are willing to put in the time to look for them, as many seem interested in doing. There also seems to be a larger variety of DX targets available in the higher bands such as 25m and 31m. For the most part, these broadcasters don't fool around with QRP, and their signals are pretty dominant. Conditions of late have not favored Europe or Africa so there may be more activity from these regions than I think. The number of broadcasters using remote sites is also surprising. It seems that the relaying of program content for others is big business and for many countries, much cheaper than running their own 250kw stations. We also seek comment on the applicability of IEEE 1613-2009 – IEEE Standard Environmental and Testing Requirements for Communications Networking Devices Installed in Electric Power Substations ... ARRL claims that PLC systems complying with IEEE-1613 “would virtually guarantee that there would be no interaction between amateur stations and PLC systems,” and that compliance with the standard has been required by the Commission’s since 2002. As background, the Commission’s rules require that PLC systems conform to engineering standards promulgated by the Commission and adhere to industry approved standards designed to enhance the use of PLC systems. Is compliance with this IEEE standard required by the Commission’s rules (i.e. is this an industry approved standard designed to enhance the use of PLC systems)? Would compliance of PLC systems with this standard facilitate the sharing of these bands between amateur stations and PLC systems? Are there PLC systems deployed that do not comply with this standard? Would compliance with this standard obviate the need for amateur stations to maintain a specific separation distance from transmission lines? We recognize that the separation distance required for PLC systems and amateur stations to coexist will depend on the power at which the amateur stations are permitted to transmit. We propose that amateur stations in the 135.7-137.8 kHz band be limited to a maximum EIRP of 1 W, as is required by footnote RR 5.67A, and which we adopted in the WRC-07 R&O. Is this EIRP limit appropriate for facilitating sharing between PLC systems and amateur stations? For the 472-479 kHz band, we propose to adopt transmitted power limits consistent with RR 5.80A. Amateur stations will be limited to an EIRP of 1 W in the portion of Alaska within 800 km of the Russian Federation and will be permitted to transmit at up to 5 W EIRP elsewhere. Is this EIRP limit appropriate for PLC systems and amateur stations to share this band? Should amateur stations be required to reduce their EIRP below 5 W when close to transmission lines and at what distances? We seek comment on these proposals. We also seek comment on the practical application of a separation distance requirement, and, specifically, what resources and information amateur radio operators will need to comply with our rules. Amateur licensees will have to determine the location of transmission lines in their vicinity to determine if they are permitted to operate stations using these frequency bands. The amateur licensees will need to differentiate transmission lines from the electric distribution lines that connect distribution substations to customer or house wiring. High voltage transmission lines are typically attached to large steel towers that are easy to identity. However, lower voltage transmission lines are typically attached to wooden poles. Although the wooden poles used for transmission lines are usually taller than the wooden poles used for distribution lines, we recognize that distinguishing the two types may not always be straightforward. We seek comment on whether amateur licensees will be able to identify the transmission lines in their locality. If amateur licensees are not able to reliably identify transmission lines, should we require amateurs or ARRL to affirmatively verify the locations of transmission lines with utilities or UTC before an amateur station begins transmitting? be required to obtain prior FAA approval and have to comply with FAA painting and lighting requirements. We note that adopting a maximum antenna height for amateur stations in these bands will aid in sharing of the spectrum with PLC systems by limiting the number of transmission lines that would potentially be in direct line-of-sight of amateur station antennas. We seek comment on what maximum antenna height, if any, we should adopt for amateur stations in these bands. We also invite comment on whether to adopt transmitter power limits for amateur stations, in addition to the EIRP limits we are proposing. If so, we seek comment on what the power limits should be. We observe that, in the 2002 Amateur Radio NPRM, the Commission proposed to limit the maximum transmitter power in the 135.7-137.8 kHz band to 100 W PEP because of the possible difficulty of measuring the EIRP of an amateur station in this frequency range. Also, in 1998, ARRL submitted data for the 135.7-137.8 kHz band showing that relatively short antennas can only produce ranges of EIRP that are well below the ITU’s 1 W EIRP limit (i.e., 10-40 mW for a 100 foot antenna and 1-4 mW for a 50 foot antenna) with a transmitter power output of 200 W PEP. The Commission did not consider either power limit at that time, because, as noted above, it decided not to adopt an allocation for amateur operations in this band. Given that we have adopted such an allocation in the WRC-07 R&O above, do either the 2002 Amateur Radio NPRM or ARRL’s 1998 study provide a basis for determining transmitter power limits now? Should these transmitter power limits vary depending on antenna height – e.g. we could allow a 200 W PEP limit for antenna heights not exceeding 30.5 meters while permitting only 100 W PEP for taller antennas. Should the transmitter power limits differ between the 135.7-137.8 kHz band and the 472-479 kHz bands? In response to the WRC-07 NPRM, commenters addressed a number of steps that could facilitate amateur use of the 135.7-137.8 kHz band. Amateur operator John H. Davis (Davis) proposed that no amateur station should be automatically controlled to ensure that the amateur operator is able to quickly terminate transmissions if necessary. Davis also suggested that it may be appropriate to also prohibit software-driven modes that determine their own operating frequency without human intervention. Should we adopt Davis’s suggestions? ARRL’s states that there is no rationale for limiting the occupied bandwidth in the 135.7-137.8 kHz band to less than the full 2.1 kilohertz, and that a stricter limit would not be conducive to experimentation with narrowband data emission modes in the future. Should we adopt any bandwidth limitation for either of the frequency bands? In the WRC-07 NPRM, the Commission requested comment on whether it should limit operating privileges in the 135.7-137.8 kHz band, e.g., to Amateur Extra Class licensees. None of the commenters believe that such a restriction would better facilitate Amateur/PLC sharing of the band. In particular, we note that ARRL states that it would be consistent with Commission policy to make this frequency band available to Amateur Extra, Advanced, and General Class licensees. Should we limit operating privileges for these bands in accordance with ARRL’s statement? Should we propose to authorize CW (international Morse code telegraphy), RTTY (narrow-band direct-printing telegraphy), and data emissions throughout the 630 and 2200 meter bands as we did for our 2200 meter band proposal in 2002? 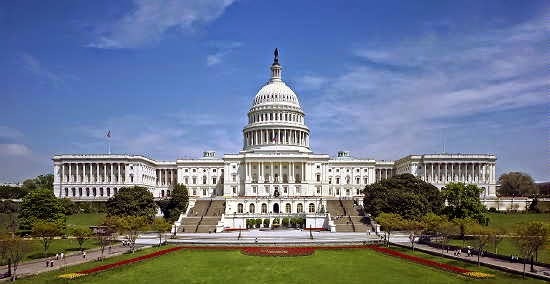 We also seek comment on amending Section 97.3 by adding definitions for the terms effective radiated power, isotropically radiated power, and LF. to adopt exclusion zones or use other methods to protect these Federal uses of the band. Should we delete the unused non-Federal allocations from this band? 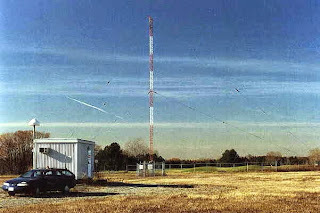 To be consistent with the International Table, we also propose to require that amateur fixed stations operating in the 2200 meter band not cause harmful interference to stations in the FS and MMS that are authorized by other nations and require that these amateur stations take any and all corrective action, if harmful interference is reported to us. We seek comment on these proposals. It would appear that the nature of enquiry is extensive but it is the next step needed before the LF / MF bands will become a reality in the U.S. Following publication of the NPRM in the Federal Register (see daily updates here to see when it appears), stakeholders will have 60 days to make comments. 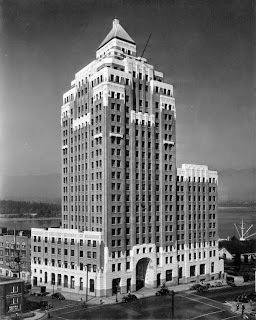 Comments can be written or posted via their online comment page once it is opened. A thirty-day reply-to-comments period then ensues. One source that I have read indicates that there is usually about 12-18 months before NPRM publication and rule enactment, should there be no major stumbling blocks. Whenever the final decision to implement comes will depend on how the enquiry proceeds. I would urge all those interested in seeing these band become a reality to file comments when the opportunity becomes available, following the Federal Register posting. Comments could include your opinions on power levels, methods of stating / measuring power levels, restrictions on operating near power transmission lines, modes allowed, etc. 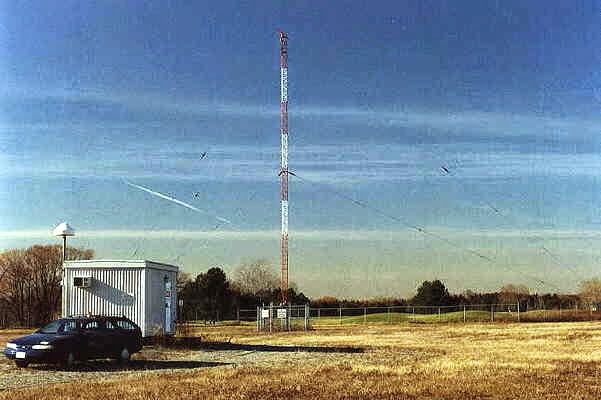 It is particularly important for U.S. experimental stations to file a detailed report on their operations, including accurate descriptions of antenna systems and transmitter details. As well, I would urge Canadian amateurs that have had experience operating on either of these two bands, to file comments regarding your experiences, with particular emphasis on the lack of interference caused to PLC signals and the lack of interference caused by PLC signals to your own operation. Rest assured that U.S. power authorities will be putting their resources ($$) into one last lobby for as many restrictions as possible and it is not in our interest for the NPRM comments to be one-sided in their favor. Lets all hope for a swift outcome to something that has been taking far too long. With the release this week of NPRM (FCC 15-50), U.S. amateurs have moved one small-step closer to seeing the 2200m and 630m bands become a thing of reality. The NPRM seeks input on a number of questions that rulemakers are still pondering when it comes to implementation of the new bands. Stakeholders are requested to submit comments on a number of issues addressed in the document and have 60 days to do so once the document has been published in the Federal Register which is updated daily. Following submission of comments, a number of options still remain open for FCC rulemakers and I rather suspect, from the vast scope of the NPRM's inquiry, that the process could drag on for some length of time yet. Take solace in the fact that the NPRM is indeed a necessary step in the right direction and shows that the proposals are moving forward, finally! The major focus of the NPRM appears to be centered around determining appropriate levels of power and the viability of amateurs coexisting on the frequencies shared with Power Line Carrier (PLC) systems. Indeed the major stumbling block, at least as far as 2200m is concerned, has always been the strong objection from power authorities that amateur signals will interfere with their control signals. PLC interference as well as possible interference to the Maritime Mobile Service (MMS) is also cited as a concern for the 630m proposal. One might argue that lumping these two bands together in a single NPRM is the best way to go while others might say that chance of success would be much better by treating them separately ... time will eventually tell. Service Rules for the 135.7-137.8 kHz and 472-479 kHz bands. 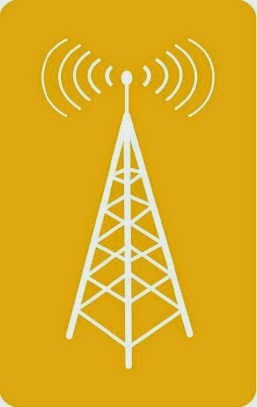 We are proposing service rules for the amateur service in the 135.7-137.8 kHz and 472-479 kHz bands with the principal goal of enabling sharing of this spectrum among licensed amateur stations and unlicensed PLC systems. As the demand for radio spectrum has continued to increase, we have sought to make more efficient use of spectrum by providing for sharing of frequency bands for multiple purposes.While we recognize the importance of PLC systems to the functioning of the electric power grid, we also believe that there are benefits to providing amateurs access to these bands, including providing amateurs with new opportunities for experimentation. Moreover PLC systems and the expected amateur use of these bands have characteristics which make coexistence possible. PLC systems are limited to use on transmissions lines and, consequently, are not present in most residential neighborhoods where amateur licensees live. along with appropriate technical rules, amateur stations can harmoniously operate on the same frequency bands as PLC systems. The cornerstone of the technical rules we are proposing is physical separation between amateur stations and the transmission lines upon which PLC systems may be present. 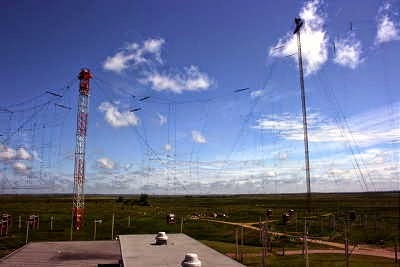 We propose that amateur stations be permitted to operate in these bands when separated from transmission lines by a specified distance. Such a separation, in conjunction with limits on the amateur stations’ transmitted EIRP and antenna heights, will enable PLC systems and amateur stations to coexist in these bands. In addition, we propose to limit amateur stations to operations at fixed locations only to ensure that this separation distance can be maintained reliably. We seek comment on this overall framework. In order to develop the necessary and appropriate service rules to meet our goal of providing for the coexistence of amateur services and PLC systems in these bands, we seek detailed comment on the technical characteristics of both the PLC systems and the amateur stations. This information will allow us to set an appropriate separation distance. Although the Commission in the WRC-07 NPRM inquired into the technical rules and methods that would assure coexistence, commenters provided little in the way of concrete information. ARRL submitted a technical analysis based on an NTIA technical report supporting an assertion that PLC systems in the 135.7-137.8 KHz band will be sufficiently protected from amateur stations transmitting at an EIRP of 1 W with a separation distance of 1 km from the transmission lines carrying the PLC signals. However, this NTIA technical report is from 1985 and therefore may not account for any subsequent developments. To assist us in determining the optimal separation distance, we invite commenters to submit information on the technical characteristics of PLC systems that are currently being operated by utilities or likely to be deployed in the future. How tolerant are these PLC systems of signals received from other stations transmitting in the same band? What electric field strength at the location of a transmission line will cause a PLC system operating on that line to malfunction? What types of malfunctions would the electric power grid experience from electrical interference? How many PLC systems are currently operating in the 2200 and 630 Meter bands? Can these existing PLC systems be modified and could new PLC systems be designed to operate in other portions of the 9-490 kHz band, thus avoiding co-channel operation with amateur services? At what power do these PLC systems operate and how long are the transmission lines over which they send signals? At what voltage level do the transmission lines upon which these PLC systems are deployed operate and how does the PLC systems’ tolerance of other signals depend on the voltage level? What electric field strengths are produced in the vicinity of transmission lines by the PLC signals travelling over the transmission lines? signals from PLC systems operating on transmission lines? Do the experiences of amateur stations and utilities in other countries and along the United States border with Canada yield any useful information? operating. How should our rules address the potential for new transmission lines to be constructed closer than the specified distance to pre-existing amateur stations? We do not want to inhibit the ability of either PLC systems or amateur services to grow and expand without imposing unnecessary burdens on either. Is it possible for utilities to refrain from geographically expanding their PLC operations within the relatively small portion of the 9-490 kHz band that we are making available for amateur operations, and is this something utilities would do on their own accord, given the Part 15 status of PLC systems? Should our rules explicitly prohibit utilities from deploying new PLC systems in these bands?